We are fully back into the swing of things with school. The kids enjoyed their drama and sports classes on Tuesday, today starts our piano lessons and Erik’s Aikido, which he is looking forward to so much, one thing he doesn’t like to give up in Summer, but mommy likes the little break. We just keep motoring along, and as I think this September may be our busiest month I can ever remember , I am sure October will be here before we know it. Quick meals are key when you have a lot going on, like this one simple, easy and a seafood dish the whole family enjoyed. Yes even me! 1. Start a large pot of water boiling to cook your pasta, cook to your desired tenderness,. 2. While pasta is cooking, saute onion and garlic in oil in large skillet until tender. Add remaining vegetables and salt, cook additional 2-3 minutes until tender. Set aside vegetables. 3. Add shrimp to skillet and cook 1-2 minutes until just pink. Return vegetables to pan and mix with shrimp. 4. While cooking vegetables and shrimp place marinara sauce in small sauce pan and heat. 5. Divide pasta between your serving bowls and toss each with about 2 Tbsp of marinara sauce. 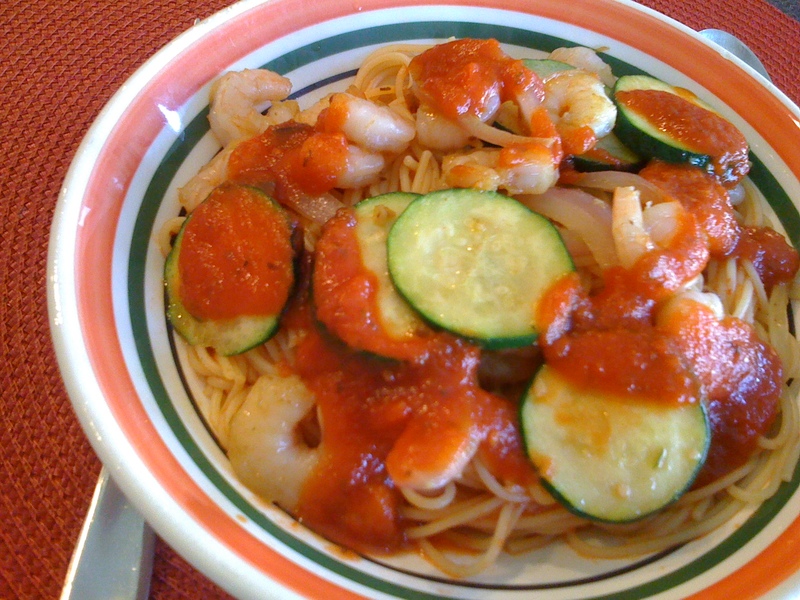 Top with Shrimp and Vegetables plus additional marinara sauce. Here is a funny little thing about our family. I don’t like cheesecake, I know strange to hear a woman say this. My husband is not much of a dessert lover, there are few things in the dessert category that he really loves. However, cheesecake is one of those things. As this month’s Crazy Cooking Challenge is Cheesecake my hubby got to have this treat that I very rarely make. The rules have changed a bit. We used to have to find the recipe on another blog however, now we can find it any ol place we like. Now the options really are endless. 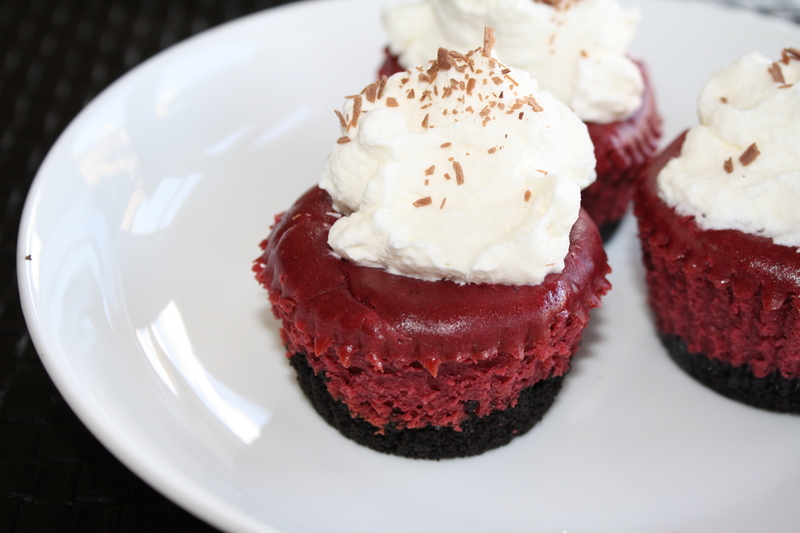 I chose to make these cute little mini red velvet cheesecakes from Betty Crocker . As I didn’t have one, again me no likey the cheesecake, I will just have to tell you what everyone else said. They were a hit! Apparently quite rich, so you probably won’t need moire than one and the real beauty of the recipe is you can freeze them for up to 5 months! Hello Christmas Baking! I hope you enjoy these tasty little morsels! 1. Line 16 regular sized muffin cups with liners. Mix together the Oreo crumbs and butter and press into bottom of cups to form crust. 2. Beat the cream cheese and sugar together. Add cocoa, vanilla and red food coloring. Beat in eggs. 3. Scoop cream cheese mixture into crust lined tins. ( they will be pretty full). 4. Bake at 350 degrees for 25 minutes. Remove from oven and cool for 1 hour. Cool an additional hour in the refrigerator. 5. Beat together the whipping cream and 1 Tbsp icing sugar until stiff peaks form. Scoop onto cheesecakes. Top with chocolate flakes. I am not a breakfast eater. For one thing I am just not hungry first thing in the morning, secondly I am usually tired and really don’t feel like cooking up something delicious. So I just pour myself a large glass of chocolate milk and sip away while I check Facebook, write my morning blog post. Then sometimes I am craving breakfast food, so I have to make it for dinner. My breakfast eating family doesn’t mind though as I don’t usually cook them breakfast either, I will just make them toast, cereal or a bowl of porridge. Waffles are a rarity in the morning, but a welcome treat at night. 1. To make waffles blend together all waffle ingredients. 2. Preheat waffle iron, and cook until done. 3. For Berry Cream- Beat whipping cream and powdered sugar until creamy peaks form. Gently fold in strawberries and blueberries. 4. 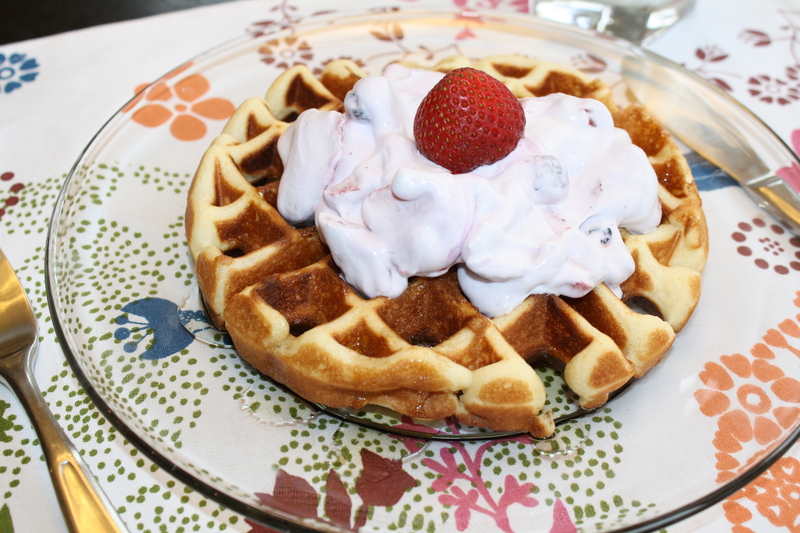 Serve on top of waffles with additional berries and maple syrup if desired.